Place chicken breasts between 2 pieces of waxed paper. Gently pound chicken with flat side of meat mallet or rolling pin until about 1/4 inch thick; remove wax paper. 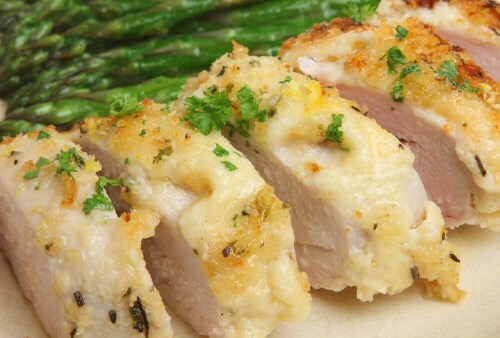 Place 1 ounce of feta cheese in the center of each chicken breast, and fold in half. Spread 2 tablespoons almond meal in the bottom of the prepared baking dish. Arrange chicken in the dish, and top with remaining almond meal. Bake 25 to 30 minutes in the preheated oven, or until chicken is no longer pink and juices run clear.